Data Deluge: By their very nature all biological structures are non-random. By their very nature all biological structures are non-random. From a Volume called SCIENCE ON FORM: 3D Dynamic Morphometry for Bridge between Structure and Function, which was the edited form of the Proceedings of the Second International Symposium for Science on Form, held in 1988 at the University of Tsukuba in Japan. By their very nature all biological structures are non-random. They come about by orderly morphogenetic processes which place the elements into precise relationships. A high degree of spatial order is, in fact, required for the execution of most bodily functions. The examples are rare where one could say that randomness is the governing principle of biological structure. On the other hand, the most powerful methods for obtaining morphometric information, namely those of stereology, require stochastic conditions - that is random interactions between the measuring probes and the structures under study - because they are based on principles of geometric probability. Weibel then goes on to describe some methods that are applicable to lung, a highly non-random tissue. 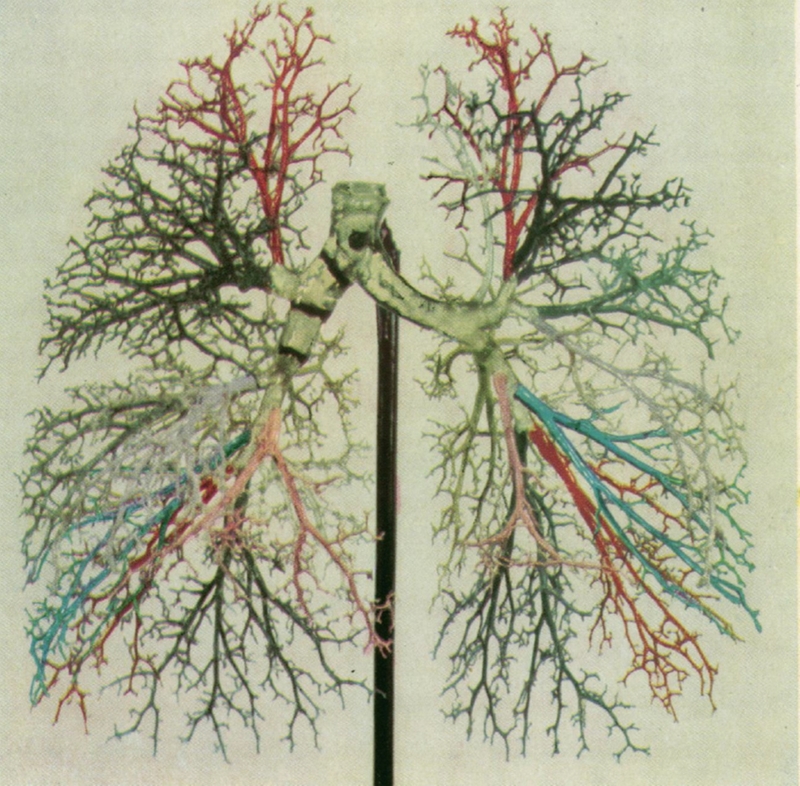 Cast of a human bronchial tree from Tompsett, D.H. (1952). A new Method for the Preparation of Bronchopulmonary Casts. Thorax. 7, 78.